There’s more to fly fishing than matching blizzard hatches and catching rising trout. Even an urban river flowing through the heart of Los Angeles (yes, L.A.!) can offer fine opportunities to cast flies and hook strong fish. The Los Angeles River slices through Downtown L.A. like a shimmering switchblade. The L.A. River is flanked by large 45-degree concrete embankments, graffiti-tagged walls, chicken wire–encased decomposed granite levees, and numerous overpasses and bridges. Along her banks you might find abandoned shopping carts and occasional homeless encampments. And, from the freeways that parallel her, you might hear the faint sounds of the infamous Los Angeles traffic. This is a true urban river that no one in his right mind would associate with fly fishing, but for those who dare to venture down to the Los Angeles River’s banks, they will experience some of the finest carp fishing in the city’s metropolitan area. The Chinese labor force that worked on the Pacific Railway during the late 1800s introduced carp to the Los Angeles River system. These immigrant workers created fish farms along the banks, and they also cultivated freshwater clams. In 1914, a great flood destroyed the farms along the banks of the river, washing away hundreds of carp and displacing the freshwater clams. These fish and clams have flourished for more than 100 years, and today they inhabit the Los Angeles River by the thousands. Friends of the Los Angeles River The Friends of the Los Angeles River is a nonprofit organization dedicated to protecting and restoring the natural and historic heritage of the river system through inclusive planning, education, and wise stewardship. Once home to steelhead and grizzlies, the Los Angeles River meandered through wetlands, marshes, willows, alders, and sycamores, providing desperately needed water for the region. Running from the suburbs of the San Fernando Valley to the ocean in Long Beach, the Los Angeles River flows through 14 cities and countless neighborhoods. The Friends of the Los Angeles River’s mission is to change this perception, and to restore and protect this unique resource. For more information about the Friends of the Los Angeles River, go to www.folar.org. My carp-fishing journey started around 2006 when a good fishing buddy, Jon Nakano, was on a routine bicycling workout along the river. While riding on the high concrete path, he noticed something moving in the water near the overgrown brush on one of the many natural islands in the middle of the river. Jon stopped, and to his amazement he witnessed a large homeless man charge out from the island and launch his body with outreached hands into the river. The man belly flopped onto a large carp, grabbing it like a rogue grizzly bear, and then disappeared back into the heavy vegetation. So, Jon thought, there are carp in the L.A. River. Jon kept his discovery under wraps; he told only a few good fly fishing buddies about the carp. We trekked in and caught many fish on small, neutrally buoyant Cottonseed flies, drifting them along the banks and through the seams to laid-up fish. We caught big carp, and it was pretty cool stuff. The flies were simple, the fish were plentiful, and we had them to ourselves! Today, a new generation of hard-charging carp anglers fly fish on the Los Angeles River; many of them are personal friends of mine. They continue pushing the envelope of fly patterns and urban angling techniques. There are two popular entry points to the Los Angeles River. Both are accessed off the Golden State, I-5 Freeway, just north of Downtown Los Angeles. The first access point is off the Los Feliz exit: turn right, go east, cross over the river, and then park and walk in on the south side of Los Feliz Boulevard. The second easy access point is at North Atwater Park; there is parking in the lot adjacent to the river. The river is slippery, so we usually fish off the concrete embankments, but there are plenty of strong carp. You’ll have a great day! I have fished many popular fly patterns for river carp, and I have created a few of my own variations. I would like to share one go-to carp fly with you. It’s a unique variation of the San Juan Worm. This fly has evolved into a completely new pattern, and it has upped the local carp-fishing game. From the first time I saw it, the McTage Foam Tail Trouser, created by Trevor “McTage” Tanner, from Denver, had me very intrigued. It is an innovative adaptation of a San Juan Worm that creates natural movement in its segmented tail, and it rarely snags weeds. Trevor says he came up with this pattern after having the San Juan Worm consistently hang up on the sticky river bottom. Trevor’s engineering background enabled him to visualize a solution. Using hand-punched craft foam beads strung onto a piece of thread, he formed a buoyant tail that lifts the rear of the fly and undulates in the current. By slightly weighting the end of the foam tail with a brass bead, it bounces up and down when retrieved. Using the right number of foam beads is key to making the tail bend and bounce. Trevor uses 12 to 13 foam beads in the tail, and a brass bead at the end secured with light-cured acrylic finish. The bead chain in the middle of the hook, plus a single bead at the hook eye, allows the fly to sink with its nose pointing down. This helps the fly avoid snagging the bottom; if left alone, the fly literally stands on its head. Submerged and stripped, it dances and bounces along the bottom like an inchworm. You can swim it, dead-stick it, or just bounce the tip of your rod to make the fly come alive. Let’s just say it’s like a San Juan Worm on steroids. 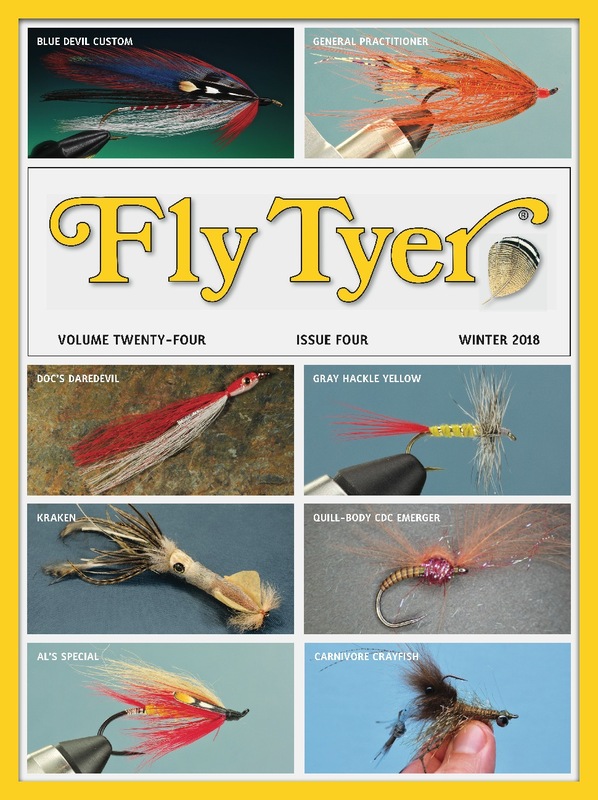 If imitation is a form of flattery, there’s been a lot of borrowed love from this wonderful fly pattern. It is being used on our urban Los Angles and Santa Anita River systems in Southern California with excellent results, and I’m sure it will catch carp and other species of fish in your local waters. It is important to credit innovation, especially when you vary a fly to meet your specific means; after all, that’s the way we move our sport forward. I can personally attest to the countless carp caught on all sorts of variations of Trevor’s Foam Tail Trouser. Al Quattrocchi lives in Los Angles. In addition to being a professional graphic designer, he is a fly fishing fiend. The last time we spoke with Al, he was packing for a trip to Christmas Island! Hook: Scorpion Gaper (or a substitute), size 8. Thread: Red 3/0 (280 denier). Body: 15-pound-test red Amnesia monofilament. Foam tail: Uni Big Fly Thread, black brass bead, and foam beads made with a hole punch.